Clean Eavestroughs Ward Off Expensive Repairs! Don Mills Roofing will help keep your eavestroughs working effectively with our professional cleaning service. ​Although no frequency of cleaning can guarantee your eavestroughs will be working flawlessly when that next big storm hits, it's one of the relatively simple and common-sense things you can do to help prevent expensive repairs down the road. 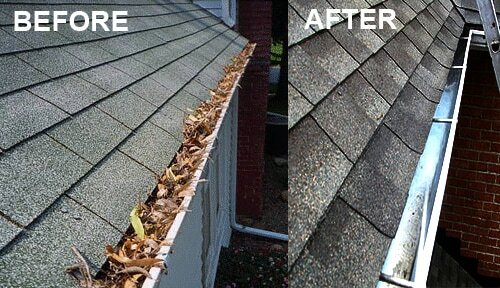 We recommend cleaning eavestroughs twice a year - in the late spring and late fall - to help insure proper drainage. Skip this important maintenance step and it's only a matter of time before your troughs damn up. And that's when the real problems can start. Clogged eavestroughs are essentially the last thing people think about - until they have a problem. Buckling or collapse. When eavestroughs are overloaded with debris, water or subsequent ice, they can pull away from the house, buckle or totally collapse. Cracked foundation. Cracks may form if water spills over the sides of clogged eavestroughs, seeps into the foundation and freezes. Wood rot. Ice dams occur when water freezes inside clogged eavestroughs. The ice can push against the roof and walls, and increase the threat of mildew or rot. Staining. Water that spills over the sides of clogged eavestroughs can discolor exterior siding. “Clogged eavestroughs are essentially the last thing people think about — until they have a problem,” says John Landry, owner of Don Mills Roofing. When it comes to scheduling eavestrough maintenance, Landry says it depends on the house. “It would be a very good idea to clean the eavestroughs twice a year,” he says. Homes sitting beneath a lot of trees that continually drop leaves, pine needles, pine cones and other debris, for example, may need more frequent attention. The best times are in the spring and fall. If working on ladders or climbing up several stories doesn’t sound like a task for you, it’s time to call in the pros. To find a good company, Landry advises looking for an experienced business that is fully licensed and insured. “When a company says that they are licensed, don’t just take their word for it,” he says. Instead, look up the company on your licensing authority's website for accredited contractors. Make sure the provider’s license is current.